Look up phlegmatize in Wiktionary, the free dictionary. A phlegmatized explosive is an explosive that has had an agent added to stabilize or desensitize it. Sometimes this is desirable either to improve the handling properties of an explosive (e.g. when munitions are filled in factories) or to reduce its sensitivity, brisance or detonation velocity. TNT explosive can itself be used to phlegmatize more sensitive explosives such as RDX (to form Cyclotol), HMX (to form Octol) or PETN (to form Pentolite). 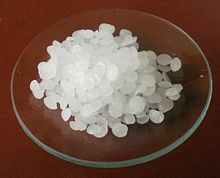 Other typical phlegmatizing agents include paraffin wax (5% used in OKFOL and Composition H6), paper or even water (used in water gel explosives). Such agents are nearly always flammable themselves (therefore adding fuel to the blast) or will at least boil off easily. Typically, a small amount of phlegmatizing agent is used e.g. Composition B, which has 1% paraffin wax added, or the Russian RGO hand grenade which contains 90 grams of "A-IX-1" explosive, comprising 96% RDX and 4% paraffin wax by weight. Another example of use is the VS-50 antipersonnel mine, which contains an explosive filling of 43 grams of RDX, again phlegmatized by combining it with 10% paraffin wax by weight. Explosive compounds may exist in material states that limit their application. For instance, nitroglycerin is normally an oily liquid. Phlegmatization of nitroglycerin allows it to be formed as a solid, commonly known as dynamite. It also allows the liquid, which is very sensitive to shock, to be handled more vigorously. This page was last edited on 14 January 2019, at 05:38 (UTC).